This is Mittens. 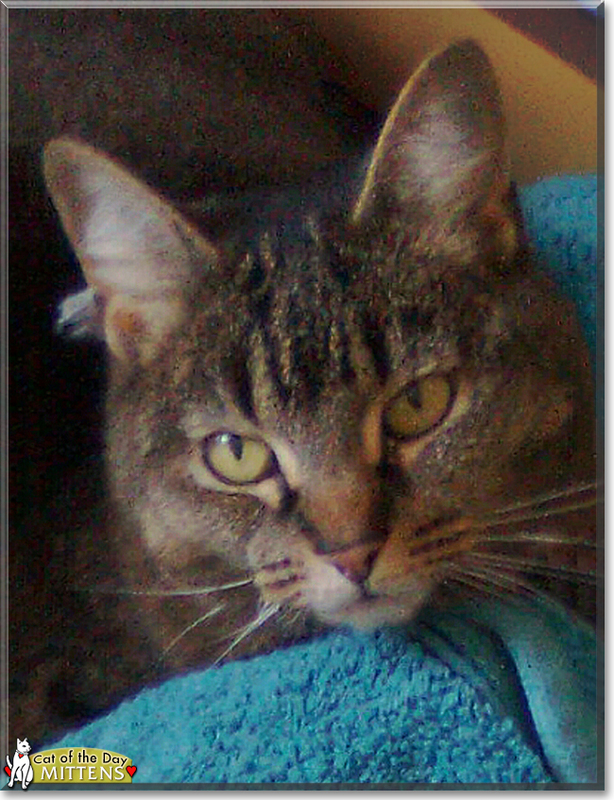 She was 14 years old and a tabby who lived in Bebington, England and is now sadly deceased. Mittens came to me at nine months old in 2002 when my stepbrother emigrated to New Zealand. She was a polydactyl (had extra toes on her front feet) and looked like she was wearing mittens which she was how she got her name. She was an inquisitive kitten who loved playing with her mouse and fishing rod toy but strangely also the green plastic strips that fastened the tops of milk bottles! Mitzypuss could be quite feisty but as she aged loved to be on my lap and later graduated to cuddling into my shoulder, purring loudly. She moved house with me a couple of times after i divorced and always settled in well. She always made me laugh and when she became poorly and I had to let her go, she made me cry. I will always be grateful for her companionship and love and I miss my special friend. Talk about Mittens in Pet Talk!